I do get worried when people discuss about bookstores in India. Not so long back, bookstores were hip here. Along with Multiplex, Quick Serving Restaurants, International fashion brands and Bittu-Tikki-walas, Book-stores were must have for the malls. Retail giants like Tata, Reliance, Rahejas etc were investing Book store chains and related leisure stores. These stores were huge, big sections for Graphic novels, which were the pleasant surprise, some stores even had merchandises and life-size action figures. It was like a dream. But last couple of years, the e-commerce evolution in India has spoiled the run of these bookstores. 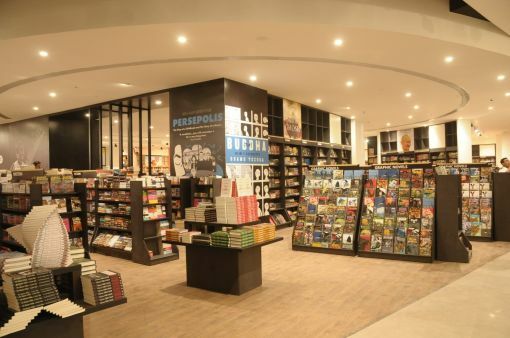 Cash on Delivery, Free-shipment, and Nail-in-the-eye discounts were too much to handle and slowly Bookstores in India are facing an acute shortage of traffic and revenues. Also the impact of ebooks, ipad and kindles have also not helped them. I always dreamed about owning a bookstore (along with Restaurant, Recording studio, ad-agency and a school :P) You can play the music you love, create a beautiful ambiance, stay around books, read whatever you want andflirt with bookworms with bookish pick-up lines ( Girl, you’re so flawless, even James Wood couldn’t find anything to criticize :). But I doubt in the coming years, there will be enough left for new bookstores. Last month, New York Times reported that in neighborhoods like Brooklyn and Manhattan, the popular bookstores are planning to close down due to ever-increasing lease price and south-ward moving revenues. In India, the situation might become similar if they don’t innovate and engage more with the readers. The extinction of bookstores can be a big cultural loss for us but in this jungle, only the fittest shall survive. It seems like this is an issue that plagues the entire world. I live on the western coast of the United States, and our bookstores either have already or will soon see their doors closed. It is a sad thing indeed! Yes, it is indeed sad thing. As I wrote above, it will be big cultural loss for us. A part of blame also goes to these stores who failed to understand technology and made the necessary changes accordingly. Love the James Wood pick-up line – Wood is so tough, that’s a mega-compliment! Sure wouldn’t mind having his brain, though! I agree. Bookstores have started closing down. So many bookshops I used to visit regularly are now closed down. Very sad. even though I have become a part of the E-book revolution, I love collecting books, esp second hand books and keep buying them. I love browsing books at libraries and old second-hand bookstores. I think so there is enough folks in the market who will still go to bookstores if stores can give right value to them. Everyone who loves reading also loves books and there is the silver-lining for bookstores. So true. But then it’s not only the case with the book stores. Even the Grocers are facing the same scenario. But somehow I still believe that the joy of bookstore wouldn’t be overshadowed. I was in Vadodra once, waiting for the last Harry Potter Movie to start, and I had two hours to kill. I spent those two hours reading a fluffy novel and then ended up purchasing the whole series. Thank you Parichita for your comment. i agree with you that all forms of business will face the song and its not that we should be very protective about it. It is their chance to leverage of personal touch, engagement and other joys which online experience cannot match . Thanks for the best wishes. That’s an after-retirement plan. For now, I am contented with engineering. It has also been my dream to own a bookstore but like you have outlined it has become more and more difficult in terms of profitability. But I still think specialty bookstores can give online portals some competition. It is sad about the bookstores, but I wonder what will happen to the libraries–maybe they will get more popular. I always like seeing my book first, although I am guilty of going to a bookstore to browse and buy it online for a bit less. True that. I think so many of us done that. I think so Libraries are safe for now.